Saturday night at the Sleeman Centre, the Storm carried the momentum of their four goal third period from one night before in handing the Kitchener Rangers a 7-4 loss with Taylor Beck collecting the hat trick in the win. The Rangers and their number two ranked powerplay went to work early and would capitalize giving the visitors an early 1-0 lead. Matthew Tipoff would score the game’s first goal after a John Moore point shot went wide and bounced off the end boards to Chris MacKinnon parked to Cody St. Jaques’ right. MacKinnon would miss across the crease, but Tipoff easily banged in his 12th of the season. The lead would be short-lived as Guelph would reply quickly on a defensive miscue deep in the Kitchener zone. After Brandon Maxwell misplayed a short pass behind the net to a defenceman, Michael Latta (pictured) would grab the loose puck and wrap it around for his second in two nights. Before the end of the period, the trio of Mat Sisca, Peter Holland and Taylor Beck would combine for a goal off the transition to give Guelph their first lead of the game. Holland started the play legging it into the Rangers zone and then threading the needle to Sisca across the slot, who quickly dished to Beck for the easy tap-in and his team best 13th. Early in the second with Beck already in the box, the Rangers would go two men up after a long debated delay of game call was handed to Tyler Carroll. With the two man advantage, Kitchener would knot the game at two on a pretty shot-pass by John Moore to MacKinnon at the side of the net for a redirect. The Storm would kill off the second penalty before striking with a powerplay goal of their own two minutes later. Beck would add his second of the night after Sam Lofquist slid across the blueline and left for Peter Holland who rotated back. Holland fed Beck along the goal line who stepped out to the bottom of the circle and lifted over Maxwell’s shoulder. Guelph would double their lead to 4-2 only 45 seconds later on J.P. Labardo’s third of the campaign and second of the weekend. After a Cody McNaughton wraparound attempt rebounded off Maxwell, Tim Campbell poked and missed, before Latta jammed at it and Labardo was ‘johnny on the spot’ for the bang in. 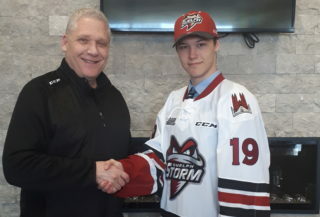 The Storm would own the two-goal advantage for almost ten minutes until Jeremy Morin picked off a clearing attempt in the Guelph zone and stickhandled around the defence before sliding a backhander to MacKinnon for his second of the game. Shots on goal in the second were 11-8 in favour of the hosts. The Storm played the third period like a club trying to build on a one goal cushion instead of protect a one goal lead and it would pay off as they added three more and skated to 7-4 final. Mat Sisca racked up his second of three points on the powerplay when he deflected a Sam Lofquist point shot in the high slot under Maxwell to make it 5-3. Minutes later, Beck would add some more insurance with his third of the game from Holland and Sisca on a rebound from in the crease. Down 6-3 and with both clubs down a man and playing four-on-four, the Rangers would roll the dice when Latta was whistled for slashing and pull the goalie to make it a five-on-three. The gamble would pay off and for the third time of the night, MacKinnon would score from inside four feet deflecting a point shot to make it 6-4 with 8:13 to play. 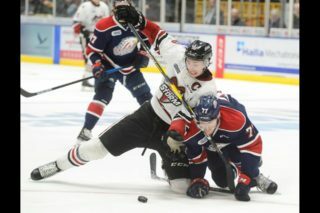 The Storm continued to forecheck and create chances while St. Jacques turned aside every other Kitchener scoring chance. The Rangers would pull Maxwell again late in the third, but Ryan Murphy was caught pinching and hauled down Tyler Carroll to put an end to the visitors’ comeback effort. With the late powerplay, Lofquist picked up his third point on a pass to Cody McNaughton who backhanded a quick feed to Carroll for an easy strike from the top of the blue paint. The Rangers outshot the Storm 16-10 in the final 20, but it was Guelph that held the overall edge by a 38-33 margin. 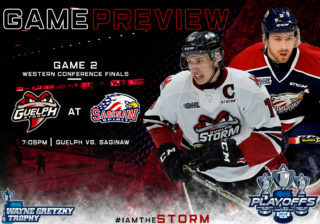 The Storm will hit the road for a pair starting tomorrow afternoon in Mississauga against the St. Michael’s Majors, before heading to London next Friday night. On Sunday, December 6th, the Rangers will make the short trip back to Guelph for a 2 pm start. 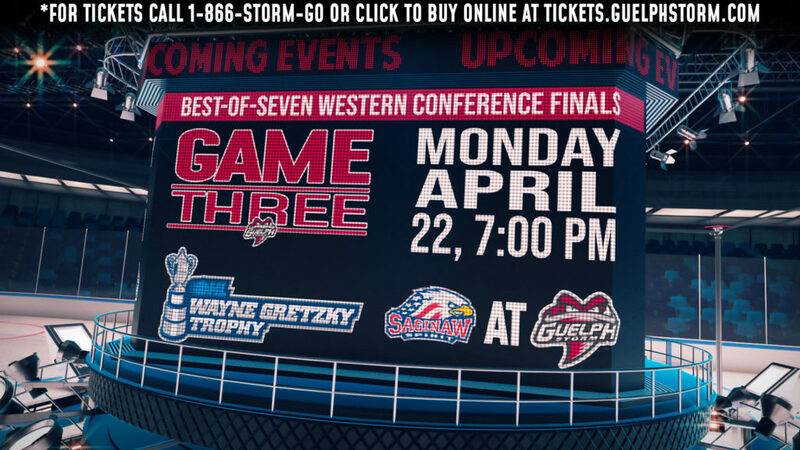 Tickets are on sale by calling or visiting the Guelph Storm box office or online at GuelphStorm.com. 1st Period-1, Kitchener, Tipoff 12 (Randell, MacKinnon), 4:39 (pp). 2, Guelph, Latta 9 5:04. 3, Guelph, Beck 13 (Sisca, Holland), 16:50. Penalties-Campbell Gue (hooking), 3:22; Sandlak Gue (boarding), 6:29; Sandlak Gue (boarding), 8:29; Randell Kit (interference), 13:44. 2nd Period-4, Kitchener, MacKinnon 13 (Moore, Morin), 4:09 (pp). 5, Guelph, Beck 14 (Holland, Lofquist), 6:09 (pp). 6, Guelph, Labardo 3 (McNaughton, Latta), 6:54. 7, Kitchener, MacKinnon 14 (Morin), 16:30. Penalties-Beck Gue (tripping), 3:21; Carroll Gue (delay of game), 3:41; MacKinnon Kit (holding), 4:38; Skinner Kit (hooking), 7:40; Tipoff Kit (delay of game), 10:12; Kelly Kit (instigator, fighting, 10-min. misc. ), 12:01; Moore Kit (roughing), 12:01; Latta Gue (fighting), 12:01; McNaughton Gue (roughing), 12:01; Beck Gue (slashing), 12:48; Landeskog Kit (roughing), 15:57; Campbell Gue (roughing), 15:57. 3rd Period-8, Guelph, Sisca 8 (Lofquist, Holland), 1:09 (pp). 9, Guelph, Beck 15 (Holland, Sisca), 6:34. 10, Kitchener, MacKinnon 15 (Kelly, Murphy), 11:47 (pp). 11, Guelph, Carroll 5 (McNaughton, Lofquist), 18:46 (pp). Penalties-Andersson Kit (interference), 0:49; Menard Gue (high sticking), 2:38; Morin Kit (10-min. misc. ), 6:34; Crescenzi Kit (roughing), 10:09; Beck Gue (roughing), 10:09; Latta Gue (slashing), 10:44; Murphy Kit (instigator), 19:31; Tresham Gue (slashing), 19:33. Shots on Goal-Kitchener 9-8-16-33. Guelph 17-11-10-37. Power Play Opportunities-Kitchener 3 of 9; Guelph 3 of 7. Goalies-Kitchener, Maxwell 8-6-0-2 (38 shots-31 saves). Guelph, St. Jacques 7-6-1-0 (33 shots-29 saves).